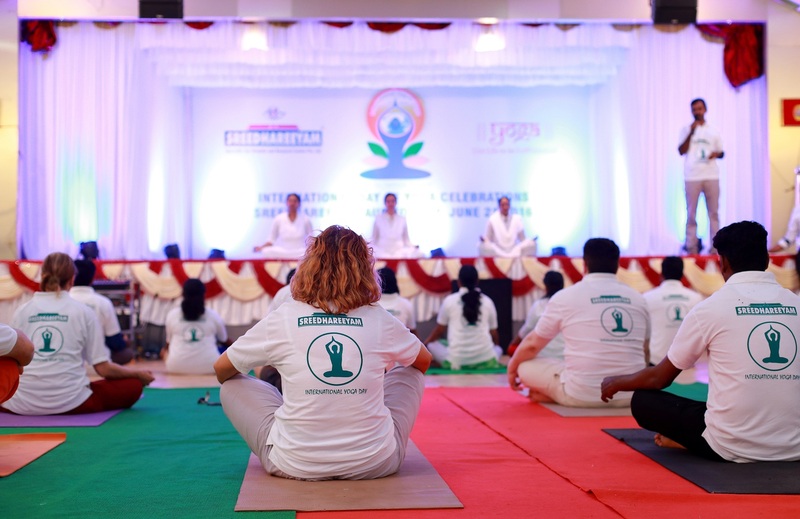 Sreedhareeyam provides the services of an exclusive Yoga club to patients and their by-standers. At Sreedhareeyam, we strive to give you a whole new experience of holistic healing. Apart from traditional Ayurvedic Netra Chikitsa, we use yoga and physiotherapy to create a complete system of wellbeing for you. Immerse yourself in the ancient ways of health care to achieve wellness. There are certain procedures in Yoga which can be benefitital to vision ans also critical in the healing process. For centuries, people from all walks of life have practiced yoga, recognizing its unique embodiment of unity between mind and body. Yoga brings thought and action together in harmony, while demonstrating a holistic approach to health and well-being. Yoga means union – the union of body with consciousness and consciousness with the soul. Yoga cultivates the ways of maintaining a balanced attitude in day to day life and endows skill in the performance of one’s actions. You are truly healthy when you are not just physically fit but also mentally and emotionally balanced. This is where yoga helps: postures, pranayama (breathing techniques) and meditation are a holistic fitness package. There are routines in Yoga which can effectively enhance your vision and also hasten the healing process. A few routines which can be done from your home are listed at the bottom of this page. Our system is a seamless blend of the body, mind and spirit. An irregularity in the body affects the mind and similarly unpleasantness or restlessness in the mind can manifest as an ailment in the body. Yoga poses massage organs and strengthen muscles; breathing techniques and meditation release stress and improve immunity. 1. Move the neck – first down and then up. Repeat it 25 times. 2. Move the neck one side to other. Repeat it 25 times. Sit comfortably facing the sun with closed eyes and swing the body from side to side gently. Sunning is relaxant for mind and body. It stimulates the retina as sun light is good for the retina and other nerve tissues. This will also help to increase the blood circulation and relax the muscles and nerves. 1. Hold the ball in one hand and toss it from one hand to another hand making a half circle. Head should move naturally and eyes should follow the ball. Blink every time while catching the ball. Do it 20 times daily. 2. Toss a ball on the ground and catch it at eye level. Blink every time while catching. Do it 20 times daily. 1. 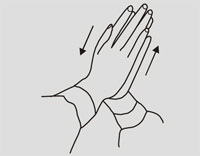 Palming: Sit in a comfortable position,close the eyes and get relaxed. Rub the palm till it becomes little warm and then cover the closed eyes (slightly cupped). Do it for 15-20 minutes twice or thrice daily. 2. Keeping the head still, move the eyes up and down 6 times. Eyes should move slowly. Make no effort and use minimum force. 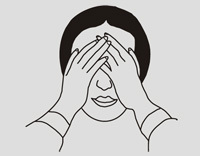 3 .Keeping the head still, move the eyes side to side 6 times – rest for a second or two in between. 1. Sit 3 ft away from a lighted candle ensuring the flame at the same level of eye ball. Concentrate on the candle flame and count from 1 to 100 in normal speed. It may be noted that while the eye sight is on the flame your mind should be concentrated in the counting to avoid strain. 2. Keep 2 lighted candles with a distance of 2 ft and sit in the middle of the candles. Move your head closer to one candle and blink the eyes and come back to the normal position, and then repeat it with other candle. Do this for 15-20 times.